Until 1849 all travel and transportation in and out of Vernon and Rockville was by teams. 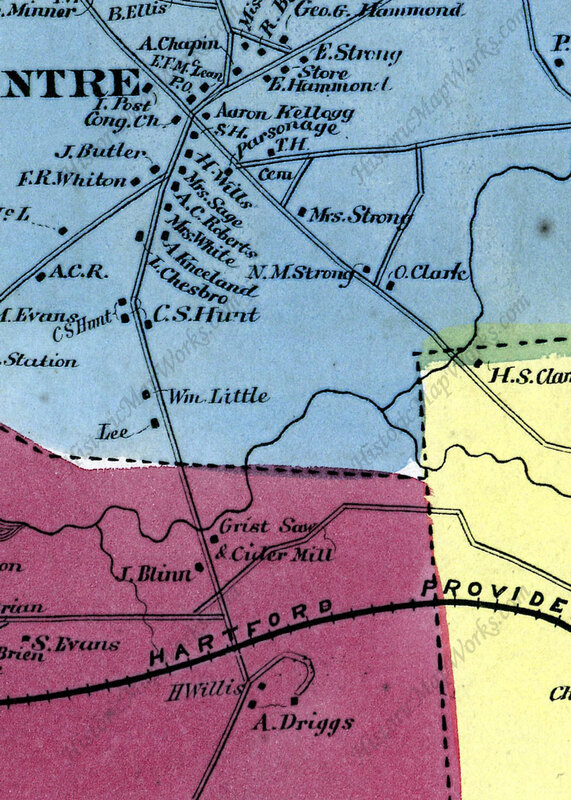 In that year the Hartford, Providence and Fishkill Railroad opened in Vernon with their major station at Vernon Depot and a small station at Kelloggsville (later Talcottville). In 1863, during the Civil War, the spur to Rockville opened. The westward flowing Hockanum River tumbles down from Shenipsit Lake and powered the mills of Rockville before taking a turn to the north just past West Road, then loops turning south towards Manchester. The loop through Ellington carried enough energy to power one more large mill at Windemere. Above Windemere is an area known in Colonial times as the Great Swamp. As the glaciers retreated 16,000 years ago a dam formed just below Route 74 creating glacial Lake Ellington that backed up past Ellington Center below Soapstone Mountain. When the dam eventually broke the lake drained leaving a wet depression well known to the Indians and early Colonists. The Great Swamp discouraged early settlement but in the 1700's the Pinneys settled on the west side of the swamp and ??? on the east side. Indian trails along each side turned into north-south roads that are today Pinney Road and Route 83. 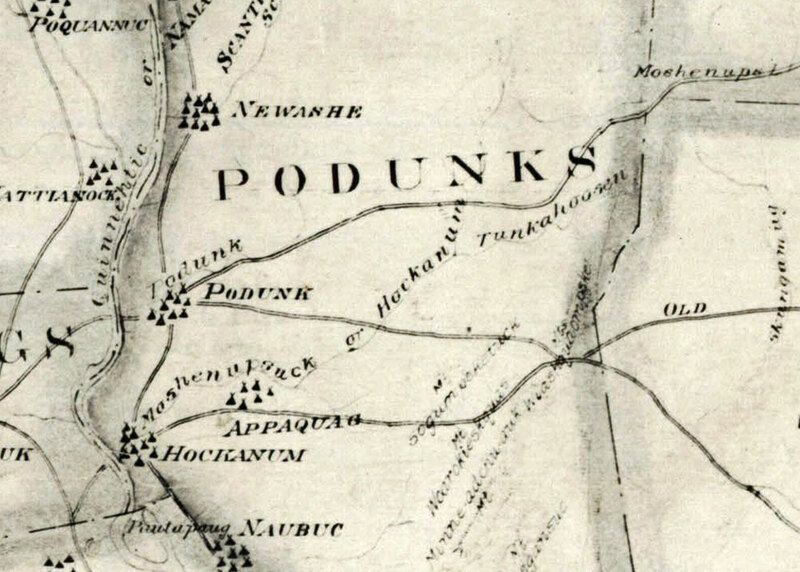 The two north-south roads were connected at the south end of the Great Swamp by today's Route 74 as this was the location where the Hockanum River narrowed and was fordable. Many of today's residents remember how the road flooded after a good rainstorm before improvements were made. Early maps show a second small loop to the north before the Hockanum River passes under Route 74. The river will be rerouted here when the railroad is built. The geography of the area is important as it determines the route the railroad will take from Rockville to Melrose and Warehouse Point. It crosses the Hockanum at this narrow point and then follows the western edge of the Great Swamp north to Ellington as does Pinney Road. In October 1876 the Connecticut Central Railroad opened a branch from Melrose to Rockville via Ellington. The line ran south along the western edge of Ellington's marshes and then east into Rockville. It had iron rails and and hewn ties. Passengers in Ellington were accommodated at a modest wooden depot near the intersection of Pinney Street and Frog Hollow Road and at a flag stop in Windermere near the mill. Passenger trains of the day were limited to 20 mph and freights to 15 mph. In 1880 the railroad was leased for 15 years to the larger New York & New England Railroad. In 1887 it was deeded to them and a period of improvement began. Steel rails replaced iron ones. The railroad changed hands a number of other times with the New Haven Railroad owning it in 1908. Overhead wires were added during 1906-08 to permit use of trolley cars over the rails as part of the Interurban system, whose purpose was to get trolleys off the street lines and onto railroad lines where delays were fewer and greater speed was possible. Operation began in January 1908. The Rockville station was on West Street, the site of a car barn and powerhouse. The Interurban competed with street trolleys and the growing number of automobiles. It failed because of infrequent service and cost factors, closing passenger service in 1914. Freight shipped was largly agricultural - fertilizer, manure, feed and timber products. The financially ailing New Haven Railroad cut back service on the Melrose-Ellington section in the late 1930's and abandoned it in December 1937. Most of the tracks were removed by the early 1940's. The Rockville Ellington section was not abandoned until 1964 and the track removed shortly after that. The stations were dismantled in the 1940's. A street trolley line also ran along Route 83 from Rockville to Ellington which opened in 1906. This ran until 1926 when it was replaced by busses. The Melrose Line connected to the Rockville Line at West Street where the Rail-Trail currently crosses. From there it made a great arc toward Ellington crossing Talcottville Road (Route 83) just north of Oldenders. It then curved north just east of the Vernon Water Treatment Plant and crossed the Hockanum before heading north to Ellington. There was a stop at Windermere near the mill and a station at Main Street in Ellington. From there the railroad turned west with a stop at Sadd's Mill before heading to Melrose. Railroads and trolleys were considered a public service and by law required to operate seven days a week. As the mills were closed Sundays the rail lines needed a way to generate customers. Their solution was to build parks and fair grounds along the lines with picnic and music facilities. These flourished during the trolley era from about 1890-1910 before automobiles became common. Local examples include Laurel Park on the Hockanum River at the East Hartford Manchester border. It also likely benefited Hyde Park in Rockville, also a trolley stop on the Stafford Line. On the Melrose Line the park was known as Piney Ridge Park. The line also serviced Piney Ridge, an amusement park located just between Broad Brook and East Windsor. Most trolley companies built parks — like Piney Ridge — to create revenue on the one day no one went to work, Sunday. Piney Ridge featured a large pipe organ, a dance floor on trolley springs, and a baseball field. The dance floor with trolley springs allowed people to ease their knees as they danced the night away. The baseball field hosted games to two major players, Babe Ruth, and Lou Gehrig. Unfortunately when the Hartford and Springfield faced financial debts, the company went out of business. Their streetcars were brought to Piney Ridge and scrapped. By 1926, the track was gone, and the Rockville Branch with it. To encourage more people riding trolleys on Sundays, small park-like destinations were constructed by the trolley companies to provide the public opportunities to picnic and be social. These special destinations became known as "trolley parks". Having the Warehouse Point area of Connecticut strategically about equidistant to the big cities of Hartford and Springfield, it seemed to be a natural location for a trolley park. Warehouse Point at that time was mostly a farming community with its inherent farming related aromas, which were deemed by some as being pure country air - "good for the lungs and what ails ya". In a small area just outside of Warehouse Point proper and slightly west of, but including, the Scantic river gorge, there came into being Piney Ridge Park. Set in a heady grove of pine forest, a picnic area was set up which very quickly evolved to include a dance pavilion, a ball field, a carousel, and many more recreational amenities. Families now had an after-church fun destination to look forward to, fleeing some of those very hot, Tobacco Valley summers aboard the ever popular, naturally air-conditioned open trolleys. The short heyday for most of these trolley parks was arguably the 1910-1920's. As the public became more sophisticated and the automobile flashed upon the scene, with subsequent decreasing attendance it became uneconomical for the trolley company owners and shareholders to maintain the smaller facilities. DeVito, Michael C., 1973, 192 pages, "Diary of a a Trolley Road". Transportation Bulletin, No. 80 of the Connecticut Valle Chapter of the Natonal Railway Historical Society. The story of the Hartford & Springfield Street Raiway Company. "Cascades and Courage" by George S. Brooks, 1955, 529 pages. This is the classic local history book. The entire text can be found and searched online.